In 1996, a few days after Christmas, I was driving from my home in Torrington, Connecticut, to North Adams, Massachusetts, a city about which I was writing a book. As usual, I left about 5:30 a.m. and drove north on rural Route 8, which wanders through the hill towns of the Berkshires. As I crossed the town line into Hinsdale, Mass., I heard a train rumbling in the distance. A half-mile later, I looked to my left down tiny Maple Street, and there it was, just a few hundred feet away. So I made a quick turn, stopped, got out of my car, and watched the endless parade of boxcars and tankers. And then I saw it — Gloria’s Place — and I just melted. Fortunately I had my camera on the front seat, and I captured the scene just as I saw it. 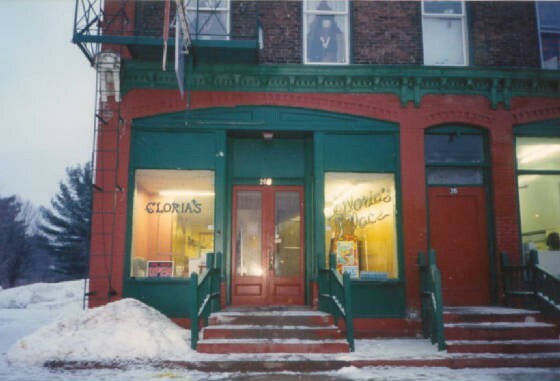 On a cold, gloomy New England day, at exactly 6:45 a.m., Gloria’s Place was added to my ever-growing list of unexpected discoveries. I live in Massachusetts now, and I seldom travel on that road. And Gloria’s has passed into history. The building is still there, but it has been “prettied up” for the new restaurant that occupies the space. But on the wall near my computer, the picture stares at me every day, keeping the memory alive. I try to spend as much time as I can carefully observing and recording all the seemingly uneventful stops on my journey through life. For this writer and artist, there are many more Mornings On Maple Street ahead. 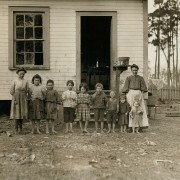 A desperate situation: Catherine Young family, of Tifton, Georgia.